Why is sushi eaten with soy sauce? Edo style sushi was created during the Edo period in Japan (1804-1830). 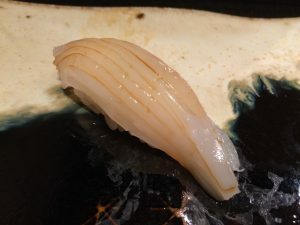 The expansion of the soy sauce culture of the Edo area (currently Tokyo) had a big influence on the creation of Edo style sushi. In a time when refrigeration and other technology had not yet been developed, soy sauce played an important role not only in taste, but also in preservation. A surprising number of tasks in the Edo style utilize the scientific effects of soy sauce. First of all, by lightly boiling down the topping, bringing out its flavor and creating a glaze. To put it scientifically, this a clever use of the odor eliminating effects of soy sauce, eliminating the raw odor. Also, long ago zuke (soaking in soy sauce) was also used for fish other than tuna. This was a way to utilize the bacteriostatic effects of soy sauce, which stop the growth of Escherichia coli (E. coli). Boiling down (tsume) represents the thermal effects of soy sauce. By adding soy sauce, mirin and sugar then boiling down, the amino acids in the soy sauce and the sugar react and the goal is to create a delicious glaze and a nice scent that stimulates the appetite. Adding a small amount of soy sauce when making rolled egg omelets has the effect of enhancing and bringing out the flavor and sweetness of the ingredients. 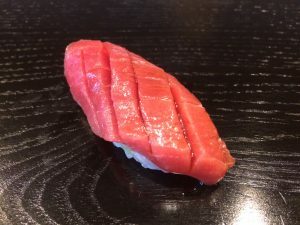 Soy sauce is generally overshadowed by the sushi topping and vinegar rice, but soy sauce plays an important role in bringing out and enhancing the delicious taste of the sushi. Next Next post: Why aren’t the prices included on the menu at sushi restaurants?